This entry was posted on Tuesday, December 4th, 2018 at 9:27 am. Westbury did it the hard way but maintained their superb unbeaten record by coming from behind at Meadow Lane. On a damp, cool afternoon it was a true case of a whole squad effort and great teamwork to overturn a half-time deficit and come out with 3 points at full time! Just 4 weeks ago United had won 5-3 in the return fixture at Clevedon, but on this occasion it was Town who started better because, despite Josh Ferguson firing narrowly wide in the opening seconds, the visitors had the better of the early play and took the lead on 7 minutes. Defender Glen Hayer played the ball out wide to Lucas Vowles, who sent in a great cross which was met by Syd Camper’s towering header. It began to be a frustrating afternoon for the hosts because some lovely approach play by Ferguson, Francois Allen, Callum Demkiv, Dan Demkiv, Joe Stradling and Jamie Jordan went unrewarded, with no finishing touch on a number of occasions. When a shot was possible, visiting goalkeeper Sam Blackiston made a fine close-range save from Allen, showed good hands when Jamie Jordan tried his luck from long range then, when Blackiston was beaten, one of his defenders got back on the line to clear a Stradling attempt! 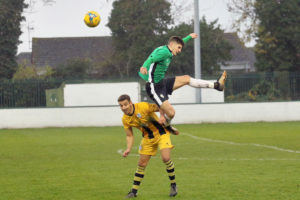 The major talking point of the match came around the half hour mark; keeper Ed Baldy did well at Camper’s feet, however the ball broke to Vowles whose goal-bound strike was blocked by Jordan Pinder’s stunning goal line clearance. Clevedon were adamant Pinder had handled the ball, however the referee gave a corner instead! Pinde,r along with defensive partner Dan Jordan, went on to have brilliant matches with a number of timely tackles and interceptions. A double substitution at the break inspired United and the spirit in their camp was exemplified by Jamie Jordan dropping back to play really well at full back. The players introduced were Ricky Hulbert and Will Stead, who both played their part as their side improved. Urged on by skipper Ian Jeffery, they burst forward after Camper had headed wide and drew level from the penalty spot on 53. Dan Demkiv was clattered by Blackiston and his brother Callum stepped up to equalise from the spot. Westbury were fully on top now and Baldy was only needed to do routine goalkeeping while his teammates went all out for a winning goal. Ricky Hulbert forced Blackiston into a save, then Jeffery and Ferguson both did likewise from direct free kicks. It was a Ferguson set-piece that set up the winner on 73 when he sent in a clever ball which was excellently headed in by Ricky Hulbert! The fine all-round play continued until the end with Town unable to create anything more than a weakly-struck free kick, which was easy for Baldy to save. * Star Man; Dan Jordan Team; Ed Baldy, Joe Kirkpatrick, Ian Jeffery, Josh Ferguson, Jordan Pinder, Dan Jordan, Joe Stradling, Jamie Jordan, Francois Allen, Callum Demkiv, Dan Demkiv. Subs ; Ricky Hulbert, Will Stead, Dan Kovacs (used) Steve Hulbert (unused).